Tsui Hark is always hit-and-miss with me. My favorite Tsui Hark films are Once Upon a Time in China 2 (the epic face off between Jet Li and Donnie Yen), Time and Tide (some insane action scenes) and Double Team. Yes, I said it. I love Double Team. It’s insane, crazy kitschy fun. Seriously, who could have thought the idea of casting Jean-Claude Van Damme, Dennis Rodman and Mickey Rourke in a coloful action movie? I saw this film back in December. I haven’t seen any incarnations of the Dragon Gate Inn films. I was aware it was a remake or re-imagining of the story and that it was going to be in 3D. I viewed in this interest of seeing where Chinese special effects have gone and what Tsui Hark would do with such a huge production. Tsui Hark is an imaginative filmmaker but often is undisciplined. He’ll imagine fascinating places and sets up great set pieces but he often wants to do too much. It all ends up creating thrilling sensations in parts than telling a story from beginning to finish as a whole. The worst example being The Legend of Zu, where the visuals and the world was interesting, there was nothing remotely emotional for me to hold on to. Eventually, it goes so long, I just tired out and tap out. As a side note, I thought it was very smart to have him helm the first third of Triangle (the three’s collaboration between him, Ringo Lam and Johnnie To). I’m sad to say, Flying Swords of Dragon Gate is Tsui Hark going way too far with his imagination again. There is no story or much character to speak of. 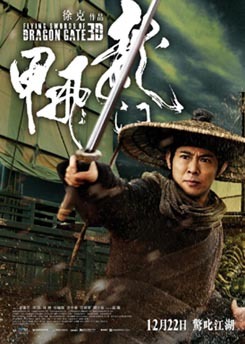 Jet Li is here to fight, he does not get a full character at all. Zhou Xun is a charming solid actress but she does not have much to do here. She breathes humanity into the story every time she’s present but there’s not enough of her or humanity. 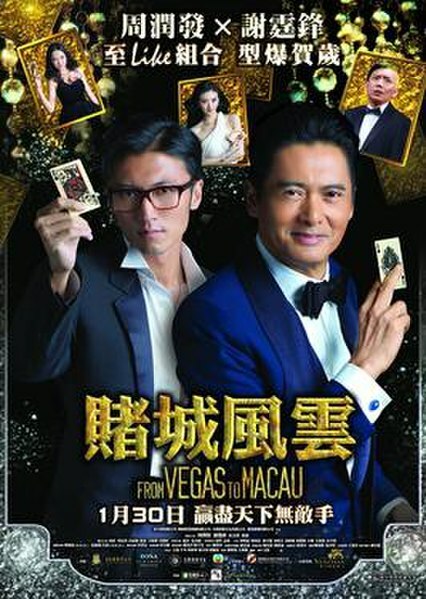 There’s a gag with Aloys Chen Kun playing two roles (as both the villain and a lovable oaf) that goes on way too long. Shake this film and half an hour would have fallen off. I am not a punitive or bitter person, but let’s call a spade a spade. The 3D looked awful. The CG was very fake at times. I’m never one to niptick special effects but I would have forgiven it if there was something else there to distract me. It was very forgettable. I honestly cannot recall a particular scene or sequence worth mentioning. The Mainland Chinese film market is on the rise. There’s a lot of money being thrown around to played with. I just think it should be executed with some discipline, like in Bodyguards and Assassins in where the epic scale of production was used to enhance a story. Seriously, I would have wanted to see Double Team re-released in 3D. Or heck, give me Time and Tide 2 in 3D. Now that would be something!